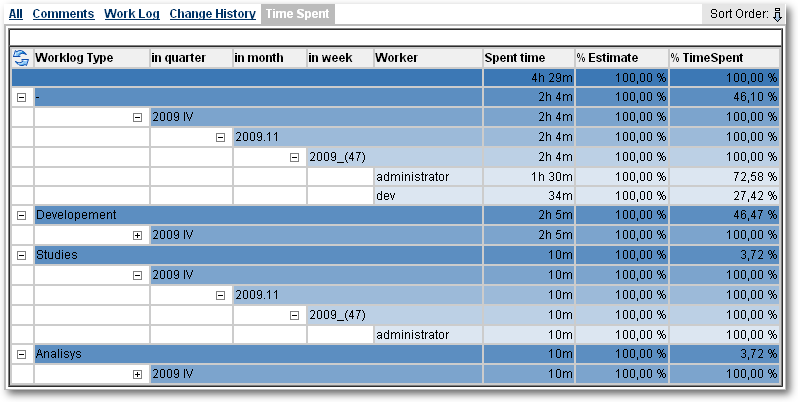 The Worklog Type Panel gives another way to display entered worklogs. You are able to display worklogs agregate depending on differents criteria. Spent Time : Agregate time spent by criteria. % Estimate : Spent Time against Original Estimate expressed in %. % Effective Estimate : Spent Time against Effective Estimate (Remaing Estimate + Spent Time) expressed in %(always 100% if no estimation have been done). % Time Spent : % of time spent against the agregate time of previous agregation level.